How to Get Your Competition Fired (Without Saying Anything Bad About Them): Using The Wedge to Increase Your Sales... | Free eBooks Download - EBOOKEE! Posted on 2013-03-23, by way_vs. Traditional sales methods focus on the relationship between the salesperson and his or her prospect; the problem is that someone probably already has the account and the advantage of the last look. Schwantz, president and CEO of the Wedge Group, formulated a selling system that tackles the challenge of breaking the prospect's relationship with the current provider. He presents a series of questions that allow clients to reveal current dissatisfactions while you remain neutral. The goal is to prompt the prospect to come up with solutions and invite you to solve them, rather than the other way around. The Wedge addresses a delicate question, which is key to succeeding: If you really want me to be your new rep, how are you going to handle firing your old one? According to Schwantz, if you are confident that the prospect is willing to fire your competition, you've most likely won the account. Because it is a nonintuitive way of selling, implementing it will involve some discomfort at first. 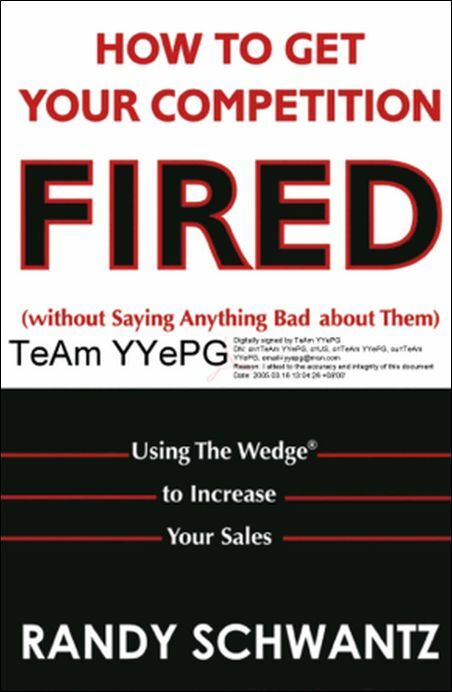 No comments for "How to Get Your Competition Fired (Without Saying Anything Bad About Them): Using The Wedge to Increase Your Sales...".